I look forward to the first weekend in April and October every year, because those are the weekends of what we Mormons call General Conference. It's a big deal because as members of the Church of Jesus Christ of Latter-day Saints, we believe in a prophet who's alive today. General Conference is when the prophet gives inspired sermons, along with other leaders of our church, via live satellite broadcast to the whole world. If you don't know much about General Conference, it's given in four two-hour sessions over a Saturday and a Sunday. When I wasn't fetching cups of water or being elbowed in the eye socket by a small person in my lap, I enjoyed the first three sessions. But during the fourth and final session, there was also an open house for the public at a Muslim mosque just 15 minutes away. It was only the one day and just for a few hours. And I really wanted to go. I love my church, and the more I love it the more richness and beauty I find in different religions, not just my own. Learning about them helps me codify what I believe and why, and drawing parallels between my faith and others' (or noticing the differences) deepens my appreciation for my God and my membership in the Church of Jesus Christ of Latter-day Saints. I also knew it could do the same for my children. Aside from being interesting and educating them about the world, I knew the open house would probably create a dialogue about faith in our house. One of the things I love about the public school my kids attend is how they have friends of all religions, and some with no religion, and their experiences have prompted some amazing discussions about our beliefs and why we live the way we do. It's added a depth to their faith that I don't think would've been there otherwise. Not at their age, anyway. So it was decided that I'd take the older three kids (no need to bring the younger ones and make other peoples' houses of worship as loud as ours is) to the open house. 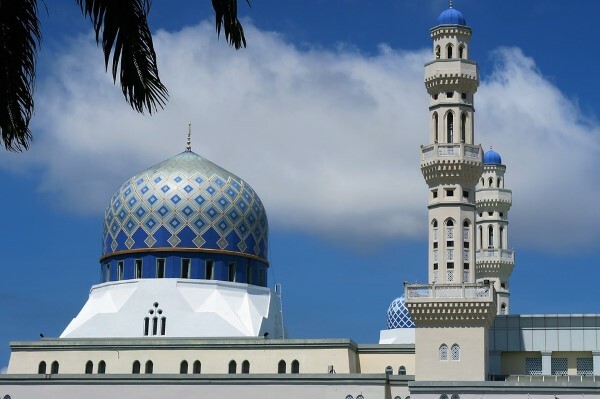 Skipping General Conference to visit a mosque? Perhaps not the decision you'd expect from a devout Mormon, but that's what we did. As we walked up to the door, a little girl who belonged to the mosque started saying "Americans! Look — Americans, mom!" With 6 kids I'm totally used to a dull murmur of shock and surprise following us wherever we go. Today it was just for a different reason. It was very crowded inside, with probably 40 members of the mosque and probably the same number of visitors for the open house. Someone directed us to take off our shoes and we entered the main hall. The imam was at the front, taking questions from the audience. We'd planned to arrive just in time for the second "Intro to Islam" presentation from the imam, but he got so many questions they ran out of time. That was a bummer, but we'd watched some videos and read up a little bit on Islam before we left home so the kids still knew what was going on. Our sock-feet padded across the carpet, patterned like hundreds of prayer rugs all pointing toward Mecca. We got some refreshments from a volunteer member of the mosque ("Are you sure you want the donuts? You can get those anywhere but I have baklava!") and walked around the periphery of the room, where there were teenagers standing next to tri-fold boards explaining aspects of Islam and answering questions. I thought it was so cool how the youth were out there, ready to explain their religion, and I suppose that's what being a minority religion does to you. Although Mormons are Christians, we are still very much a minority, and I'm always proud of our youth's ability to articulate their beliefs and stand on their own. Salat (daily prayer) was about to begin soon, and we were all invited to stay and observe. A boy handed us an English translation of what the imam was going to be singing/saying during salat. At 5:20 the imam at the front of the room turned his back to us and started singing out the call to prayer. It was beautiful and comfortable, and though people were still talking and milling around the room it gradually grew quieter. Muslims started taking their places behind the imam, waiting. I eyed a few of the teenagers, just standing in their socks quietly and patiently. They weren't scrolling through their phones. They were just there. Just being still. I think the ability to be still is one of the greatest losses to our society as it becomes less and less religious. Even aside from the salvation part of religion, believing in God means developing patience and self-control. The ability to wait quietly without being entertained by a glowing screen. The ability to understand that some moments are more important than you are. Everyone needs to learn this. Prayer started at 5:30. I know a little about Islam, but I've never seen a Muslim prayer before. In between the imam calling out the words of salat, there was a very deliberate silence for a roomful of 80 people to achieve. It was very inspiring. I thought it was beautiful, all these people bowing and kneeling in unison to communicate with the divine in their own way. I thought of how General Conference, where the beloved leaders of our church were speaking right now to thousands of people in the conference center and millions of Mormons watching in their homes via the Internet. Very soon, millions of Mormons would be bowing their heads in unison as the speaker said the closing prayer of the final session of General Conference, at almost the same time that millions of Muslims across the world (or at least, thousands of Muslims across our time zone) were simultaneously offering their prayers to God in unison. Salat lasted 7 minutes. I felt like I was witnessing something holy, and yet these were regular people. There was a crying baby, a Muslim toddler chattering away at the back of the room while her sister whisper-shouted at her to be quiet, and a few guys who came in late for prayer. All things that I see on Sunday when I go to church. And yet, there's something bigger at church than just us regular people and our individual imperfections. God is there. We are there because of Him. When we got home, dinner was just coming out of the oven and we watched the missed session of General Conference over eggplant parmesan. It was uplifting and wonderful. We'd had a great day. She drew this with a pen and said it was "a henna circus tent." As I thought about my experience, I remembered an old folk hymn that was actually quoted the day before at General Conference: "All God's Critters Got a Place in the Choir." I obviously don't believe in the truth of everything I learned at the mosque that day, but I felt truth in the reverence for God that I saw there. I felt it during General Conference after I came home, and I hope to feel it always, and pass it on to my children. That's definitely interesting that you guys decided to go and learn more about Islam on their own home turf! Having grown up in an Islamic nation and still living there today--I wake up to the call to prayer on the loudspeaker every morning, and find much of the customs of living in community with Muslims very normal--i.e. knowing that we can't invite Muslim friends over to our house for dinner because our dishes/pots are not halal--but we can go out with them to eat since most restaurants here are halal. Malaysia is not a country with complete freedom of religion like the USA, and I wish more people in the world had the religious freedom that the USA has. I think that's really fascinating and cool that you did that. I read a book recently by a devout Muslim who became a Christian (Seeking Allah, Finding Jesus by Nabeel Quereshi), and he went into great detail about what it's like to live as a devout Muslim. It's so different from my life that it was so interesting to read about. Especially in today's society. That's so neat that you guys got to experience this other culture! Learning about other religions has always intrigued me; it's cool to learn about our similarities and differences, I think, especially at a time when there's some craziness, politically, regarding people from the Middle East. This is a beautiful article, Jenny. I think it is great you got to experience their prayers. I love the way you tied it all together with conference. This is so cool. I totally would have gone as well. We certainly do take it for granted! I'll have to read that. The only books about Islam I've read were by disaffected ex-Muslims (i.e: Infidel by Ayaan Hirsi Ali) and while I don't discount their experience, I realize it's like trying to learn about Mormonism by reading books by disaffected ex-Mormons (which hardly describe the religion as I experience it) so this was just what I'd been looking for! I'm sure that the timing was not coincidental! I appreciate the community aspect of church (especially when it comes to my kids having multiple role models to look up to) but I think that for me, the part I like most is that church gives me regular opportunity to evaluate myself and how I can improve my relationship with Christ. If it were college, church would be the class lectures and my everyday life would be the lab work where I try to put it into action. That's so wonderful you all visited a mosque/masjid! I am so happy to hear this as a Muslim, and I'm happy to hear you had a good experience. I've always loved going to the mosque - there is tranquility in prayer and such a sense of community there. It's something your kids will remember for years to come... the different experience and how open-minded you are!